S’mores seem to be the new “it” food like cupcakes and bacon were a few years back. When Adam ran across this recipe, he insisted that we try it as soon as possible. These cookies were delicious, especially when they were still warm from the oven. 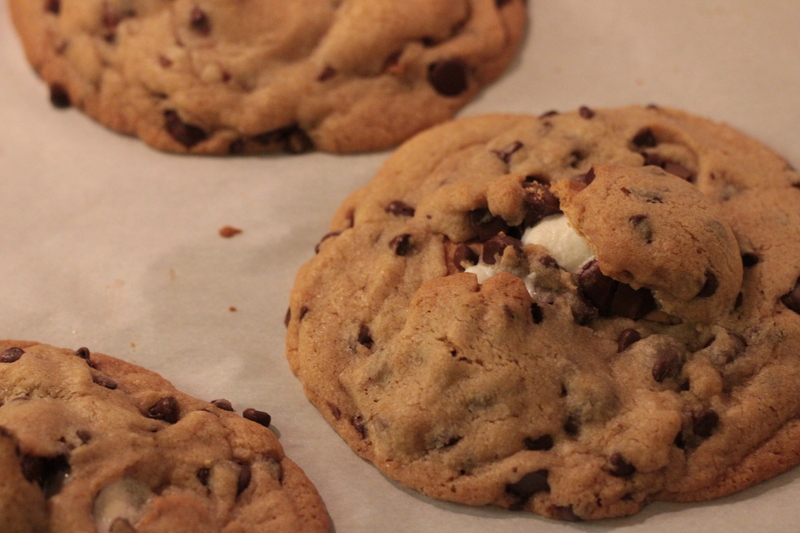 We made a few changes since the original recipe made 4 gigantic cookies. We cut down the size of our cookies to yield 8, but they were still rather large. Whisk flour, baking soda, and salt together in a medium bowl; set aside. In the bowl of the stand mixer fitted with the paddle attachment, mix butter and sugars until thoroughly combined. Beat in the egg, yolk, and vanilla until combined. Add dry ingredients and beat at low speed just until combined. (The batter should look a little lumpy.) Stir in chocolate chips. Lay half of the graham crackers on the baking sheets, four crackers per sheet. Top each cracker with chocolate and marshmallows. Lay the remaining graham crackers on top of the assembled s’mores. Sandwich the s’mores between two large spoonfuls of cookie dough. Use the remaining dough to wrap around each of the s’mores. The result should resemble a “cookie brick”. Space the cookies several inches apart from each other on the two baking sheets. Bake for 20-24 minutes, or until the tops and edges are lightly browned and the edges just lift off the pan with a spatula. The cookie dough will press on the s’mores while baking, and will continue to sink during cooling. Transfer the baking sheets to wire racks and cool the cookies on the sheets for at least 5 minutes. Transfer the cookies to wire racks and cool for another 5-10 minutes before serving. Serve warm or at room temperature.